A student of mine once wrote a paper saying he couldn’t stop eating meat because it would mean giving up too many traditions. For example, on Thanksgiving Day you’re supposed to have the smell of roasting turkey wafting through the house all day. A vegetarian meal would simply cook too fast. To a purist this is an atrocious argument. What, a turkey is supposed to be bred to ridiculous, uncomfortable proportions, housed in cramped conditions, and carelessly slaughtered, just so we can enjoy all-day cooking? I see myself as pro-animal, but not as a purist. I do take it seriously that traditions would have to change if we were kinder to animals. It’s hard to completely embrace a vision of the future with no sheep dotting the hills in Wales, and no cattle milling around in west Texas. It’s hard for me to say the good people of Dallas should close down their barbecue restaurants and steak houses. I even have some sympathy for the Eskimos who want to go on killing whales. 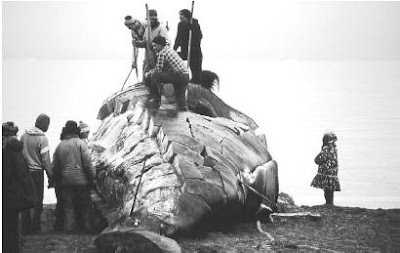 For all that the Eskimos vitally needed to hunt whales before first encounter with westerners and their resources, they weren’t as crudely exploitative as we are today. They didn’t think of the whale as a mere commodity. The Eskimos justified killing whales with the thought that they made a voluntary sacrifice—they gave themselves up for slaughter. No doubt wishful thinking, but at least this myth shows an awareness of a moral problem—how can I justify giving priority to my life over any other living creature’s life? Getting back to my student, and Thanksgiving—who says traditions have to stay exactly the same? Here it is, food that takes forever, and probably the only recipe you will ever see on this blog. Happy Thanksgiving! Use butter substitute and skip the egg to make it vegan. Make mushroom stock.In large pot, use 9 cups of water to cover 1 chopped onion, one clean chopped leek, 4 cloves crushed garlic, 1 oz dried shitake mushrooms, 1 tsp salt, ½ tsp peppercorns, ½ lb sliced mushrooms, 2 small carrots, 6 parsley sprigs, 3 fresh thyme sprigs, 2 fresh marjoram or oregano sprigs, 2 fresh sage leaves, 2 bay leaves.Simmer an hour or two, strain, and simmer some more until you have 3 cups. Set aside. Make a pie dough with 1 ½ cups flour, 6 TB butter, ½ tsp. salt, a bit of cold water.Keep in refrigerator until needed. Using a big heavy pot, heat 2 TB olive oil and add 4 cups sliced mushrooms. Sear for 6-7 minutes over high heat, add 4 finely chopped garlic cloves and ½ cup sherry.Simmer until mushrooms are pretty dry.Put all that in a bowl. Chop firm vegetables of your choice, such as potatoes, celery root, parsnips, turnips, rutabagas, fennel, carrots (best with all of the above). Use enough to nearly fill 2-quart oval earthenware casserole (or whatever you have). Heat more oil in the big pot and add a chopped onion over medium heat.Saute a little while, then add all the chopped vegetables. Also add 2 TB each of fresh marjoram, thyme, and parsley). Cook and turn for about 20 minutes. Make sauce out of stock.Heat 3 ½ TB butter in medium size saucepan and add 5 TB flour.Whisk until smooth.Gradually add stock, whisk, cook over low heat, turn off heat. Pour all the vegetables and mushrooms into the casserole dish.Add the sauce.Don’t fill the casserole to the top or it will all boil over in the oven. Roll out the dough and cover the pie with it, crimping the edges. Roll out leftover dough and cut out turkey image.Affix to top of pie using whisked egg.Brush the rest of the pie with egg.Make slits in top of pie. Place on baking pan just in case of spills.Bake in 375 degree oven for 40 minutes.Take out and let cool 5 minutes. Just discovered this site. Wonderful. Thanks. Traditions can be forms of oppression or of injustice. Racism was a tradition in the U.S. South; oppression of women is a tradition in Islamic countries and elsewhere. I don't see why traditions should justify anything. I always have a hint of annoyance when I read that people respect native peoples and cultures for utilizing all of the animal in as many creative ways as possible... As if we don't do that currently. I'm pretty sure you're not implying that we don't, but about the only time we don't use all of the animal that we are killing is when people take much of the animal home, and throw away things like the bones and giblets and such. But the modern industrial food machine pretty much makes use of everything that it butchers. From dog food to flavorings, every part of the animal is typically used since only working in such a manner can they maximize their profit from each animal. Wayne, Good point...I hadn't thought of that. Amos, I'm just saying that the fact that something is a tradition has some weight... basically because psychologically there are benefits to continuing traditions. "Some weight" doesn't mean "we should keep doing it"
I agree that traditions have "some weight". However, given the bloody history of mankind, many traditions involve oppressing or exploiting some being or damaging the environment. For that reason, most traditions should be examined twice or three times, because the history behind them is often far from uplifting or noble. Traditions often have "weight", not for ethical reasons, but for pragmatic ones. That is, traditions are extremely resistent to change and trying to change them is likely to produce a backlash. I'm afraid that you've misunderstood the "takes forever" aspect of your student's preference for Thanksgiving Day turkey: what's supposed to take forever is the cooking time--not the preparation! Oh, whoops! I thought the guy wanted to spend all day in the kitchen peeling vegetables. No? Nah, the great thing about cooking a bird is that the olfactory reward: preparation ratio is extremely high. After all, there is football to watch. As Janis Ian said/sang, this is of no philosophical import. I would reduce that sauce to one tablespoon of goo. The veggies will exude enough liquid to do the trick. Sad but true--stick bird in oven, get delicious smell. It would be easier to be a vegetarian if that weren't true. As to the sauce--maybe there's too much but it's a crucial ingredient because you get a rich, dark gravy. This stops you coveting your neighbor's Turkey-based gravy. That's the mark of a successful Thanksgiving alternative--no coveting.